A long time ago and far away, there was a drought and resulting famine on the island of Sicily. The people were desperate for sustenance. It was during the Middle Ages and there was no Red Cross or United Nations rescue efforts. As they watched their crops fail and their families starve, the people turned to prayer. The Patron Saint of Italy is St. Joseph and it was through his intercession that they prayed for help. When the heavens finally opened up and the rain replenished the land the people were very thankful to their patron saint for answered prayer. 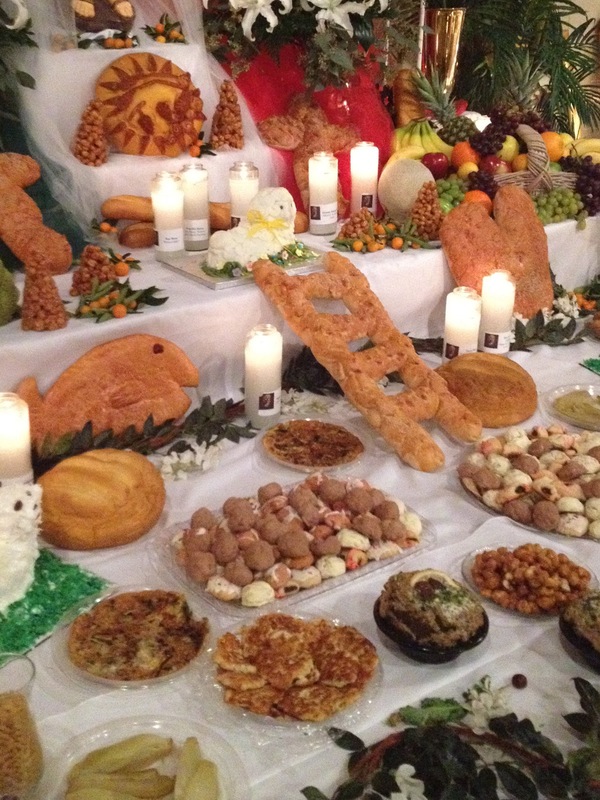 They built an altar, adorned it with breads, fish and sweets and dedicated it to St. Joseph. Thus began the tradition of St. Joseph altars in Sicily. Now Italians and Christians around the world continue the practice that recalls the devotion of the Sicilian people and their gratitude for the end of the drought that almost destroyed their way of life. Tradition has it that those who build a St. Joseph’s Altar must beg for foods and supplies from neighbors and businesses. The time and money that go into building the altar are also considered sacrifices. After the tribute of gratitude the leftover foods are distributed to the less fortunate. The foods brought to the altar are also steeped in symbolism. Many times candles are lit in remembrance of loved ones who have passed away. There are variations on the theme from place to place but there are some common characteristics of all St. Joseph Altars. Almost every component of the altar symbolizes some religious belief or story. The altar is always constructed with three levels of presentation. This represents the Holy Trinity or the Holy Family. A statue or picture of St. Joseph is placed on the top level. The altar is embellished with palms, breads, fish, sweets and wine. Since the feast takes place during Lent, meats are not used. Red, green and white are prevalent in the decorations since these are the colors of the Italian flag. Italian recipes prevail in the preparation of the items. The tables are arranged in a cross shape to symbolize Christ’s death on the cross. Altar breads are made in various religious shapes such as crosses, chalices, and hearts. Since St. Joseph was a carpenter there are often shapes that bring that profession to mind, such as a ladder or hammer. Some of the altar breads are dried, toasted with sugar and sprinkled atop spaghetti as part of the meal that is consumed. The crumbs are symbolic of St. Joseph’s sawdust. Some people save the crumbs and toss them into a storm to prevent destruction. The wine on a St. Joseph’s Altar symbolizes the miracle that Jesus performed at the wedding at Cana. A large fish placed on the table symbolizes the miracle of Christ feeding the multitudes with five loaves and three fish. 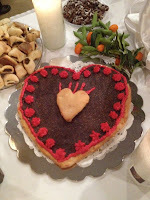 Heart shaped pastries symbolize the Sacred Heart of Jesus. Legend and tradition have it that visiting St. Joseph altars is “lucky”. During the famine that struck Sicily in the Middle Ages humans were reduced to eating fava beans, a food normally fed to the animals. They felt they were lucky to have at least those beans to eat when there was nothing else. 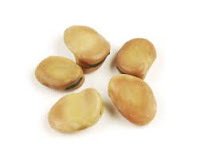 A fava bean carried in one’s pocket is said to prevent “going broke”. A fava bean placed in a pantry is said to prevent one from ever going hungry. Traditionally each person who visits a St. Joseph’s altar is given a bag with a fava bean, a prayer card and some sort of cookie or pastry from the display that has been blessed by a priest. Steeped in tradition and prayer, the St. Joseph’s Altar is a community celebration and when held in churches or reception halls (as space permits) the public is invited. The act of sharing the food is one of gratitude for the end of the famine those many years ago in Sicily, and for continued blessings received today. 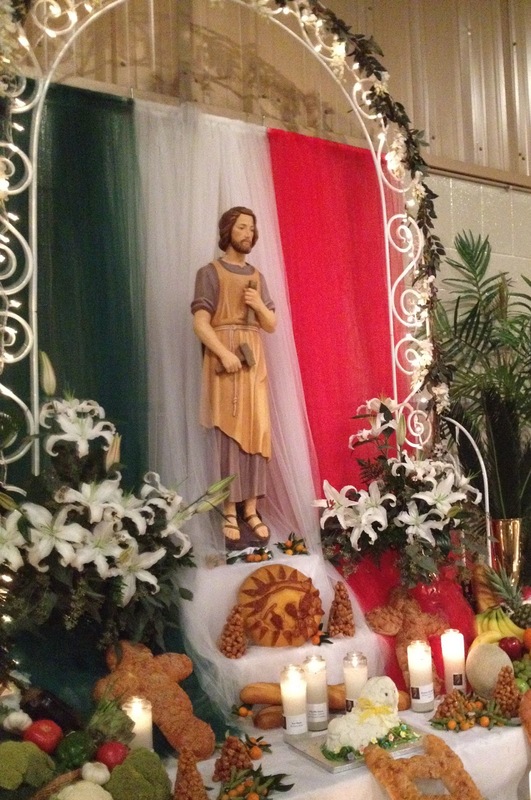 The centuries old custom of creating St. Joseph’s Day altars is a great showcase of Italian foods and a magnificent gesture of charity and faith. The pictures are from the Seventh Annual St. Joseph’s Altar of 2012 at St. John the Baptist Church in Zachary, Louisiana. 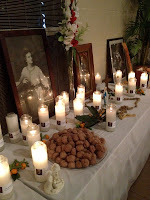 I had a bakery in my store in Port Allen several years ago and I used bake french bread in all sorts of shapes and sizes for a lady from Baton Rouge for her St. Josephs Altar. I looked forward every year to do this for her. I had no idea that you baked. You are quite a multitalented person! Thanks for your comment.